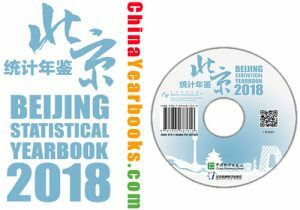 Beijing Statistical Yearbook is a large statistical book published continuously on a chronological basis. With a great deal of statistical data, this Yearbook gives a true reflection of the economic and social development and changes in Beijing over the past year. It serves as an important reference book for domestic and foreign personnel in all circles to understand and know Beijing. The overall structure of Beijing Statistical Yearbook remains basically stable. In color pages, main tendency and changes about economic and social development of Beijing have been presented with both illustration and pictures; statistical tables are the main part of this Yearbook, mainly including 24 chapters, i.e. General Survey; National Accounts; Population and Employment; Price Index; People’s Living Conditions; Government Finance and Tax Revenues; Energy, Resources and Environment; Public Utilities; Total Investment in Fixed Assets and Real Estate Development; Foreign Economic Relations and Trade; Agriculture and Rural Economy; Industry; Construction; Tertiary Industry; Transport, Post and Telecommunication Services; Wholesale and Retail Trade, Accommodation and Restaurants; Tourism; Finance; Science and Technology; Education; Health Care and Social Services; Culture and Sports; Public Management, Social Security and Social Organizations; and Development Zones, reflecting the economic and social development situation across the city through multiple fields and industries. Internal structure of chapters: Each chapter is composed of the Brief Introduction, Statistical Tables and Explanatory Notes to Main Statistical Indicators. Brief Introduction appears on the first page of each chapter, mainly introducing the main content, source of data, statistical scope, indicator standards, method of adjustment to historical data in each chapter; Explanatory Notes to Main Statistical Indicators come on the last page of each chapter, mainly giving a brief explanation to the main indicators and calculation method, etc. involved in the chapter; Statistical Tables are the core content of each chapter. Arrangement of statistical tables: In each chapter, statistical tables are arranged for the purpose of reflecting the main conditions in the field. Generally speaking, main indicators historical data tables come before current year data tables. Conventionally, the year indicated in the title of the book is the year of publication. The latest data indicated in the statistical tables in this Yearbook are data in the previous years. For example, this book is titled 2018 Beijing Statistical Yearbook, which means it will be published in 2018 while the latest data in the book is by the end of 2017. “Years” in the statistical tables are marked in three ways, each indicating a different meaning. Firstly, the statistical table is named “****** (AAAA- BBBB)”, which refers to that the data listed in the table are those from the year of AAAA to BBBB; Secondly, the statistical table contains no years, indicating that the data listed in the table are those of current year and last year; Thirdly, the statistical table is named “****** (AAAA)”, indicating that the data listed in the table are those of the year of AAAA. #: means that the item is included in the total. Grouped indicators marked with “#” are part of the total, while those without“#” mean that sum of included items equals to the total. ||: grouping symbol, means that there are multiple ways of grouping the indicators. …: means that the figure is less than the minimum measurement unit of the table. Blank: mean that the figure is unknown or unavailable. ***: means that the figure is not disclosed for secrecy reasons. Explanations include User Guide, Table of Contents, Brief Introduction, Explanatory Notes to Main Statistical Indicators and notes under the tables. User Guide appears before the Contents, giving an introduction to the overall framework of this Yearbook, and explaining the main adjustments; Brief Introduction appears on the first page of each chapter, giving an introduction to the chapter’s main content, source of data, statistical scope, standards of indicators, adjustment method of historical data, etc. ; Notes under the statistical tables make an explanation on standard of some indicators, method and scope, etc. In general cases, each chapter consists of two parts: historical data tables and current year data tables; the first tables in each chapter are the historical data tables of core indicators in the area or field, followed by the detailed grouping data tables for the current year. Generally speaking, historical data that are shown in the historical data tables can be used continuously; for some historical data that have been adjusted, please refer to the latest yearbook; When using the data, it is necessary to refer to the Brief Introduction and the explanations on the change in method system, standards and scope in the Notes under the statistical tables. Grouped data in the current year data tables mainly reflect the data in the area or field of the current year as well as the comparison with the data of previous year; the standards and scope and calculation method for the corresponding indicators, and those greatly differ from the data of the previous year, shall be explained in the Notes under the statistical tables. Beijing Statistical Yearbook is provided with a CD-ROM, which contains Chinese and English versions of this Yearbook. The CD-ROM helps users in working with and processing the data. (VI) The sum of some statistics or some relative numbers in this Yearbook might have certain calculation errors because of the choice of different units of measurement. All the statistics have not undergone mechanical adjustment. The title and order of certain chapters have been adjusted in terms of the sector classification of national economy; the names of tables have been standardized and unified, and the order of the tables has been adjusted, according to the content of the statistical tables. 1. According to Beijing General Urban Planning (2016-2035), the grouping by four functional areas has been cancelled, and the order of each district has been adjusted by the administrative division code. 2. Some indicator data have been added, reduced or adjusted in accordance with the changes in the statistical method and system of the National Bureau of Statistics. Including: adding the “hydropower, wind power, photovoltaic power” and other statistical indicators reflecting the situation of new energy in the Energy Production; adding the historical data on “main business cost” in the Main Indicators for Industrial Enterprises above Designated Size; adding the “income-profit margin” and “cost expense of per 100 Yuan of main business income” indicators in the Main Indicators of Economic Benefits of Industrial Enterprises above Designated Size; the data “grouped by urban and rural regions” on relevant indicators in such field as Industry, Investment and Consumption, etc. have been cancelled; the data grouped by exhibition area in the Statistics for Mice Industry in Beijing have been cancelled. In addition, the names of certain indicators have been adjusted and standardized; for example, “business taxes and surcharges” have been changed into “taxes and surcharges”, etc. 3. With reference to the changes in the sectorial statistical systems of Beijing Municipal Bureau of Statistics, some indicators have been added, reduced or adjusted. Including: adding PM2.5 indicator and its historical data in the Environmental Protection; adding historical data in Renminbi (RMB) grouped by “Total Value of Imports and Exports”, “Exports” and “Imports” in the Foreign Economic Relations and Trade; and the Statistics for Corruption, Bribery, Malpractice and Infringement Cases has been cancelled. Meanwhile, some statistical tables have been adjusted. For example, listing the “total volume of water supplied in the year” and the “total volume of water consumed in the year” separately in the Statistics for Water Resources, and adjusting the grouping correspondingly; adjusting the Statistics for Social Welfare and Community into Statistics for Grassroot Social Work, the relevant indicators on the number of social welfare enterprises have been deleted, and indicators on “number of certified professional social workers in grassroot organizations” have been added. 1. Adding some statistical indicators data. For example, adding the historical data on relevant information about the households of the whole city in the People’s Living Conditions part; adding the historical data on gross industrial output value of key industries and main business cost in the Industry part; adding the industry category data in the Main Indicators of Economic Benefits of Industrial Enterprises above Designated Size (by Sector). 2. Cancelling some statistical tables or statistical indicators. For example, in the Population and Employment part, the relevant statistical tables involving district in the Registered Population have been cancelled; in the People’s Living Conditions part, the relevant statistical tables on purchase quantity and expenditure amount for main goods have been cancelled; in the Industry part, the historical data tables and relevant content in the Added Value of Industry above Designated Size have been cancelled; the statistical tables on main economic indicators of state-holding industrial enterprises, share-holding industrial enterprises, Hongkong, Macao, Taiwan and Foreign-invested industrial enterprises, and medium and large-sized industrial enterprises grouped by affiliations and by registration type, etc. have been cancelled; in the Wholesale and Retail Trade, Accommodation and Restaurants part, the Commodity Sales of Wholesale and Retail Enterprises above Designated Size has been cancelled; in the Science and Technology part, the Number of Professional Technical Personnel in Public Enterprises and Institutions has been cancelled. 3. Adjustment of some statistical tables or statistical indicators. For example, the indicators order and content in the Aggregate Indicators and Speed Indicators on National Economic and Social Development in Key Years, the Structural Indicators on National Economic and Social Development in Key Years, the Indicators on Proportions and Efficiency in National Economic and Social Development, and the A Day in Beijing, have been optimized and adjusted; the table content in the People’s Living Conditions and in the Industry part have been optimized and integrated; the Statistics for Service Trade has been moved to the Foreign Economy and Trade part. (IV) Revision of text description to make it easier for readers to understand the data changes. Firstly, to revise the content of the brief introduction of each chapter, comprehensively reflecting the data content, data sources, statistical standards and the historical changes of data and so on; Secondly, to add or reduce content in the explanatory notes on main statistical indicators after each chapter; to make uniform revision or adjustment on the explanatory notes on indicators in each chapter according to the changes of indicators of that very year and so on; Thirdly, to update the content of notes under the tables, accurately reflecting the adjustments and changes of the data approach of that very year.